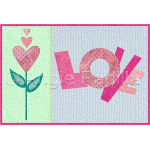 Show your love for a friend or relative with this sweet little memento! All it takes is a few little scraps AND an hour or two. Add a heap of sweetness and you will end up with a great little gift.